Lock in a great price for Hotel Les Arcades – rated 8.6 by recent guests! Great location right in front of the train station, very friendly staff and clean room with sufficient space for a quick layover. Everything was very good and as expected. The best asset of the property is the staff - both of them that's manning the reception at day and at night were simply charming and very accommodating. Clean, comfortable room. Staff was awesome and the hotel is only steps from the train station. Complimentary transport card helps you get around the city with ease. Overall a good value for Geneva. Excellent location. Excellent staff. Very comfortable bed. Very helpful, friendly staff. Took time to explain the layout of the city with a good tourist map. Exceptionally friendly staff! Very accommodating and they actually get to know you. I am lactose intolerant and they made sure that I had vegan / soya milk available for breakfast everyday. The rooms are very spacious and I had a view directly over the train station. There is a large screen TV, good security and easy check-in and check-out process. Everything. Staff exceptionally accommodating. Location great. Just in front of the train station. 5 min walk to bus station. The staff are professional, kind and make you feel very comfortable. They take the extra step which is appreciated. Rooms are clean, spacious and the location is excellent. I would stay here again on my next trip to Geneva. Very nice location very close to the the train and public transport station and walking distance to many restaurants and bars, took us about 10 minutes to get there to/from the airport. Super friendly and helpful staff, they really helped us with everything we needed. Good breakfast, good value for money in Geneva. Hotel Les Arcades This rating is a reflection of how the property compares to the industry standard when it comes to price, facilities and services available. It's based on a self-evaluation by the property. Use this rating to help choose your stay! 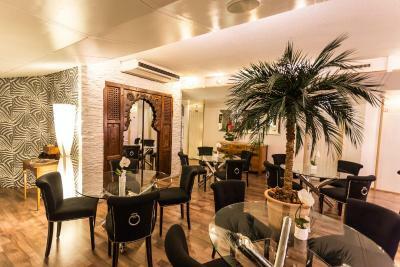 The nonsmoking Hôtel Les Arcades is located in the center of Geneva, opposite the Cornavin Train Station. Lake Geneva and the Old Town are a 10-minute walk away an high-speed Wi-Fi is available for free in the entire hotel. All rooms are soundproof, and offer cable TV, a fan and a mini-bar. Each unit consists of a bathroom provided with a hairdryer. When would you like to stay at Hotel Les Arcades? Soundproof, nonsmoking rooms with cable TV, a mini-bar, and a bathroom with hairdryer. A fan is available, as well. High-speed WiFi is available free of charge. House Rules Hotel Les Arcades takes special requests – add in the next step! Hotel Les Arcades accepts these cards and reserves the right to temporarily hold an amount prior to arrival. The entry to the hotel can be found next to the H&M store. The hotel and the front desk are on the second floor and are open 24 hours a day. There is no air conditioning available in the rooms. Please inform Hotel Les Arcades of your expected arrival time in advance. You can use the Special Requests box when booking, or contact the property directly using the contact details in your confirmation. 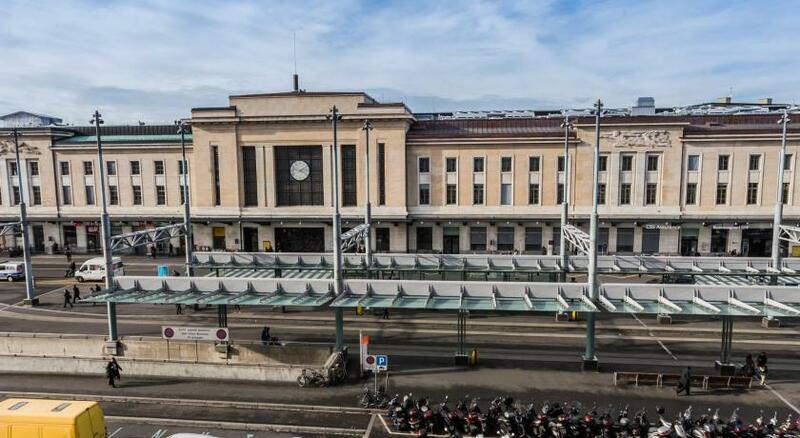 I chose this hotel because I was arriving by train late in the day and leaving the next morning for the airport, and it’s right next to the train station and also walking distance to the old town. Perfect for a very short stop. The staff, Trinh, Sam and the lady on breakfast duty were all very friendly, and the rooms are located around the central lobby area of the hotel which all in all gave it a very friendly atmosphere, not what you usually expect from train station hotels. I enjoyed myself a lot thanks to them and their help and advice. Was warm initially and had to leave my window open at night. The location was great right across from the train station. The staff especially Zada was wonderful. She was so helpful and friendly that it made me feel very welcomed. Only small issue is the bed which is not quite even - one side is harder and lower already. Otherwise, everything is really excellent. Location, breakfast but most of all the staff!They are all so helpful and friendly. Lovely staff made my 3 year old feel very welcome. Great location just next to Gare Cornavin. Much more clean and modern than other hotels nearby (I have stayed in many of them). Carefully read the directions to the hotel. Not very easy to find the first time tacked in between restaurants on the second floor of a residential block. Maybe more variety in the breakfast especially for non pork eaters. Step out of the train station and cross the road. That is how close it is. Geneva is expensive. Probably the most economical hotel at that location. Close to every thing. First row on the street. The staff is amazingly helpful and friendly also very cheerful. Small hotel. Rooms are clean with simple breakfast. Cosy breakfast area just outside the room. Good for business travel leave in the morning come back in the evening. Excellent location, directly opposite the main station. The hotel gave us passes for the Geneva public transport system which made things very easy for us. The little boats are fun! Can be noisy, no aircon, no amenities except soap&shampoo.Breakfast buffet is not replenished often,if you are a bit late not much remains but staff is helpful. Not really like a hotel but more a bed&breakfast on a floor of a building.